On summer evenings, look for this star pattern in the east, sideways to the horizon. The Northern Cross is a clipped version of the constellation Cygnus the Swan, and is really an asterism – a pattern of stars that is not a recognized constellation. However, most people have an easier time making out the Northern Cross than they do Cygnus the Swan. The Northern Cross is an asterism, or noticeable pattern of stars. 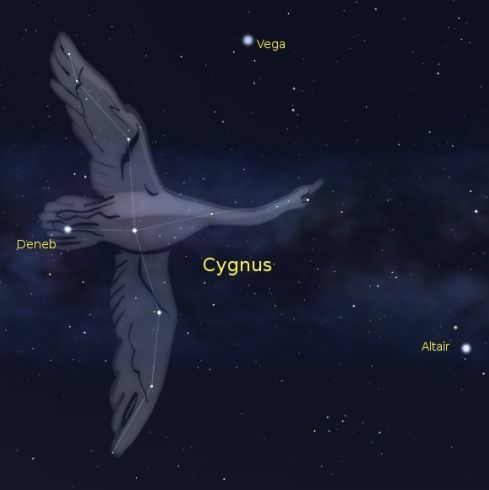 It’s within a true constellation – Cygnus the Swan. 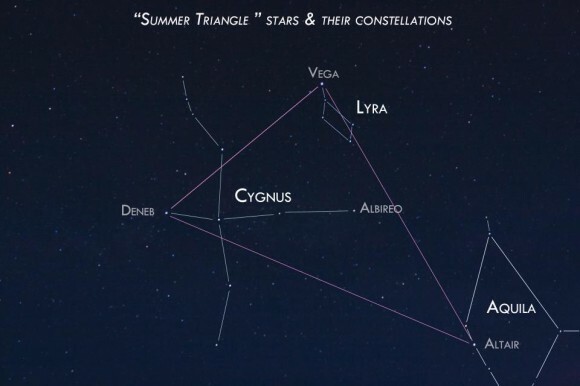 The Northern Cross and Swan pattern are within a larger asterism, consisting of three bright stars, called the Summer Triangle. Image via Bob Mohler. Northern Cross and Summer Triangle. Image via Susan Jensen. How to find the Northern Cross. 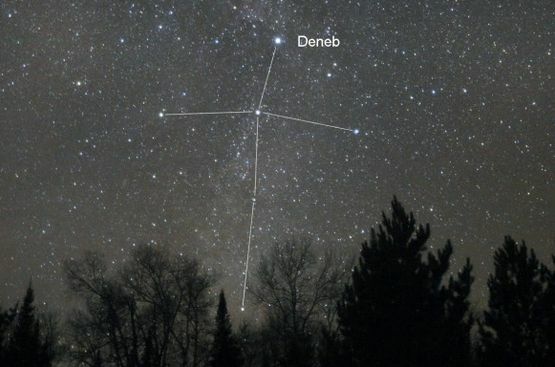 The first step to locating the Northern Cross (or Cygnus the Swan) is to find the Northern Cross’ most brilliant star, Deneb. Deneb marks the top of the Northern Cross. 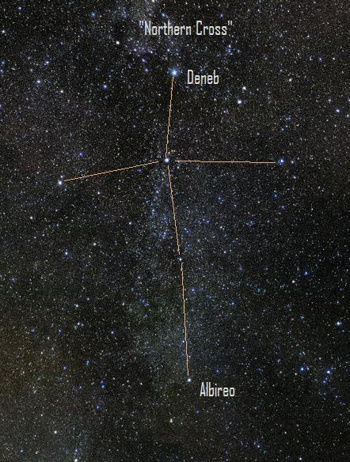 Deneb is perhaps just as well known for being one the three brilliant stars of the Summer Triangle, along with the even brighter stars Vega and Altair. 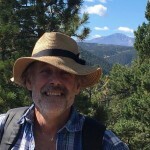 Knowing the three stars of the Summer Triangle gives you good footing for locating the Northern Cross, which is embedded within the Summer Triangle asterism. Roughly halfway between Altair to Vega, and somewhat offset toward Deneb, look for the brightest star in that part of the sky. That’s Albireo. Although a modestly bright star, Albireo is easy to see on a clear, dark night. Since there are no similarly bright stars near Albireo, it is fairly easy to find. Once you locate Deneb and Albireo, you’re only a hop and a skip away from piecing together the Northern Cross. The bright star Deneb marks one end of the Northern Cross. The famous double star Albireo marks the other end. Photo via Janne/Flickr. Backbone of Milky Way. The Northern Cross serves to point out the Milky Way – the luminescent river of stars passing through the Northern Cross and stretching all across the sky. You need a clear, dark sky to see this hazy swath of sky, whose “haze” is really myriad stars. But it’s a sight well worth pursuing. 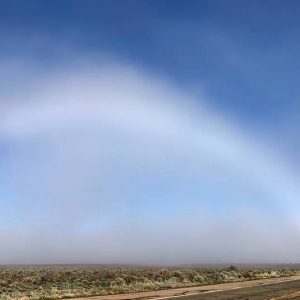 The Milky Way band we see stretched across our sky is an edgewise view into the disk of our galaxy, the flat part of the galaxy where nearly all the visible stars are. Keep in mind, though, that all the stars outside this band visible to your unaided eye still belong to our home galaxy, the Milky Way. When you look at the Northern Cross, you’re looking directly into the Milky Way disk, where the soft glow of millions of stars glazes over the heavens. In fact, the galactic plane (equator) runs right through the Northern Cross, encircling the sky above and below the horizon. On some clear, dark night, use binoculars and the Northern Cross to enjoy the star fields, star clusters and nebulae that abound within the disk of the Milky Way galaxy! Northern Cross, with bright star Deneb at the top of the Cross, on a November evening. Image via AstroBob. Northern Cross as a marker of seasons. As seen from mid-northern latitudes, the Northern Cross is out for at least part of the night all year around. It’s out all night in summer. On Northern Hemisphere summer nights, the Northern Cross shines in the east at nightfall, sweeps high overhead after midnight, and swings to the west by daybreak. By the time northern autumn arrives, the Northern Cross is still out from nightfall till midnight, but it appears high overhead at evening and sets in the northwest after midnight. When winter comes, the Northern cross is standing upright over your northwest horizon. When you see the Northern Cross in the east on summer evenings, it’s sideways to the horizon. On autumn evenings, the Northern Cross beams high overhead but runs diagonally across the sky. On a winter evening, this wondrous star formation stands vertically to the horizon! Bottom line: The Northern Cross isn’t a constellation. It’s an “asterism” or recognizable pattern of stars, part of the constellation Cygnus the Swan. How to find it in your sky.